I recently came across a forum where someone asked, “What’s the difference between ‘personal development’ and ‘spiritual development’?” He seemed to feel they’re essentially the same thing. It’s an interesting question because, at the level of the energy body, there’s a fundamental difference. ‘Personal development’ is a term that covers a lot of territory, from learning to speak a foreign language, or to dance, becoming more assertive, doing therapy or life coaching, to taking up tai chi or going to a yoga class . . . the list of possibilities is endless. Personal development – from a human energy point of view – is any activity that advances one or more of your horizontal chakras. These are the energy centers between your perineum and your forehead, that face forwards – like funnels lying on their sides. When some of the energy within one of these chakra shifts towards the front, it’s said to have advanced. The closer some of a chakra’s energy gets to its surface, the more this energy forms part of your ordinary consciousness – all that you are aware of about you, the world around you, and your experiences. You become more aware in ‘normal’ terms. Energy that’s deeper within your chakras is, as yet, still in your sub-conscious. Advancing the energy of a chakra changes your life for the better – by increasing your consciousness and/or the quality of your life. The kind of change depends on what energy is advancing and in which chakra. For example, if wealth qi advances in your 6th chakra (the energy centre at your forehead), that will lead to your wealth increasing through current or new relationships. However, not every form of personal development is suitable for everyone. 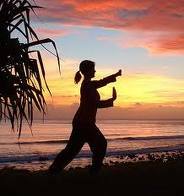 We’ve seen many people over the years, whose lives have been damaged by tai chi, qi gong, yoga, meditation or, indeed, any other form of personal development that isn’t resonant with their particular needs. In other words, if you need* to learn Spanish, but you learn German instead, some of your energy will contract rather than advance. Contracting energy reduces the quality of your life. And, to the degree you continue or remain connected with contracting or [energy-]weakening activities, people, places, possessions and so on, the more you will create a lower energy, lower quality, future for yourself. Obviously, this isn’t a popular notion. People don’t ordinarily assign a negative value to some forms of personal development. The unaware perspective on personal development tends to be, “I’ll do anything I want to do” – or – “that feels right to me.” But, unfortunately, what we want or what feels right, isn’t always what is actually good for us . . . But, advancing energy is not enough for spiritual development, which requires ascending energy. Spiritual development is a more opaque subject than the wide arena of personal development. It’s much more difficult to usefully assess it’s ‘rightness’ for us, as it requires a much more specialized form of awareness than that required to tell if our self-esteem, relationships, communication skills, health or well-being have changed for the better. The reason effective spiritual development is so much less easily seen is that it’s a product of ascending energy in your 7th chakra – the largest chakra in the energy body, located at the top of your head. This is the only chakra in the energy body that’s ‘vertical,’ that directly faces the sky. Spiritual development is distinct from personal development insofar as it only occurs when there is an ascending flow of energy – a flow that is perpendicular to that of every other chakra in your body. Effective spiritual development literally raises your consciousness. Without this ascent, a person may develop a great deal of consciousness but it will still be consciousness that identifies with the mundane world – “I am my body, mind, job, reputation, knowledge, education, social status, power, beliefs, possessions and so on.” All this egoic identification reflects, and naturally results from, energy in the horizontal chakras – the chakras focused on the world. Energy (if any) that rises within, and then upwards from, the 7th chakra progressively liberates us from these limiting identifications. This process of liberation is spiritual development. The strength and stability of their lower, horizontal, chakras. In other words, the lower chakras provide the foundation energies for the ascension of the highest chakra’s energies. Unfortunately, many seekers don’t want to be troubled by the challenges or karmas they experience in the mundane world. They may, for example, have issues with work (3rd chakra), sexual relationships (2nd chakra) or communication (5th chakra), which they find too daunting to confront. So meditation and yoga seem like preferable alternatives – ways of avoiding the more disturbing areas of their life. The central paradox for many spiritual seekers is that even though they aspire to become more spiritually aware they nevertheless need to focus more on their personal development if they are to make much spiritual progress over the years. But dealing with the challenges of life is, for many people, the antithesis of what they believe their life to be about. So the foundation of their practice – their own energy body – remains weak in critical areas, the areas where consciousness is most afflicted by obstructive karmas. Thus the stable level of many spiritual practitioners’ consciousness rises very little. Or it becomes increasingly distorted by inappropriate spiritual practices (with respect to their individual needs) as the years pass by. Chakras remain weak due to the continuing presence of stable stresses in them. To the degree the foundation is leaking energy due to unmanaged stresses and strains – low self-esteem or self-importance in the 1st chakra, anger or guilt in the 2nd chakra, fear or bravado in the 3rd and sorrows or illusory needs in the 4th, to name just a few – energy cannot rise at the crown. And if energy doesn’t rise much, higher awareness doesn’t develop much. Instead, many spiritual practitioners – including plenty of gurus, lamas, roshis and other spiritual teachers of all sorts – fall back on channeling energy into their 6th chakra, the highest horizontal chakra, and out of their mouth, substituting profound words for genuine realization. Personal development is essential for anyone who seeks balanced spiritual development. Your energy must advance further in the areas of your energy body that are weak, so it can ascend from the lower chakras to the 7th and beyond, in the ways that result in stable, grounded, higher awareness. Personal development and spiritual development are different but inter-linked activities along the same spectrum of consciousness transformation. But just as radio waves need to be managed in different ways from, say, light, a sincere spiritual practitioner needs to practice supportive forms of personal development in addition to her spiritual practices. And for those with no initial interest in spiritual matters, effective personal development inevitably leads to conscious spiritual development – just as a caterpillar inevitably begins to form a cocoon in order to become, however unwittingly, a butterfly. However, those who aspire to be butterflies without bothering with the necessary stages of ‘cocoon preparation’ are ultimately disappointed (if they’re honest with themselves) or, effectively, delusional (if they aren’t). * A need is any activity, choice or action that causes energy to ascend, from one or more of your chakras, to the 7th chakra. Anything else causes energy contractions in one or more chakras, which leads to a lower-energy future. Learning to identify your real needs is the central theme of the Living With Energy Awareness Training.